Holy Trinity offers a beautiful and flexible space and is used regularly for choral, orchestral and chamber concerts, rehearsals and exhibitions. We welcome enquiries, especially from local groups and organisations. The building is lofty and has an unusually high reverberation which means that your singing will sound particularly good! There is no fixed seating. This offers great flexibility and the possibility of using the space creatively. For exhibitions all seating can be removed, opening up a large and dramatic space. 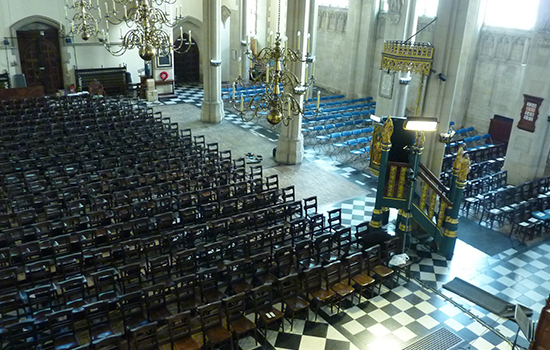 The usual layout seats 300, but additional seating can increase this to approximately 550. There is wheelchair access and a loop system. We are sorry that WC facilities are only available for evening bookings except during school holidays. The Parish Hall is home, during term-time, to a resident nursery school, but is sometimes available on weekday evenings and during school holidays. It is a rectangular room, with double-height ceiling and good natural light. There is a kitchen area with a range cooker, dish-washer and fridge at one end. The room can seat up to 40 people. (We regret that the hall iis not suitable for exercise classes). There is a second smaller, comfortable break-out room with sofas seating up to six people. However, it does not have separate access , so cannot be booked on its own. To discuss possible booking of the church or hall, including rates, please contact us.